Starting this week off on an honest note here on the blog- I'm not into a lot of the trends that are big this fall! *gasp* I know I know... as a fashion blogger it's kind of my job to keep up with the trends, and as a blogger with a focus on affordable style I try and show y'all how to keep up with trends but stick to your budget at the same time. However, I am just really not loving a lot of the current styles. Lace-up everythings (whether it's sweaters, dresses, or even shoes!)... I just can't get into it. Choker necklaces are something I'm making an effort with, and I do own a few now. But I truly believe that there is a certain time and place to wear choker necklaces, and they don't match everything. Other things I'm not really loving: army camo, over-wearing athleisure attire (it definitely has a time and place- but the trend is overdone), and only wearing dark colors in the fall and winter months. My true style is girly, bright, and preppy- year round!! That's what inspired me to pull together this look that polished enough to wear to work, but still colorful enough to be fun. I purchased this Elsa top in August's Lilly Pulizer After Party Sale, which is the best time of the year to buy Elsa's, or really any Lilly! In the next After Party Sale this winter, I'm hoping to stock up on more Elsa tops. They really are the ideal top to wear for both work or weekends. 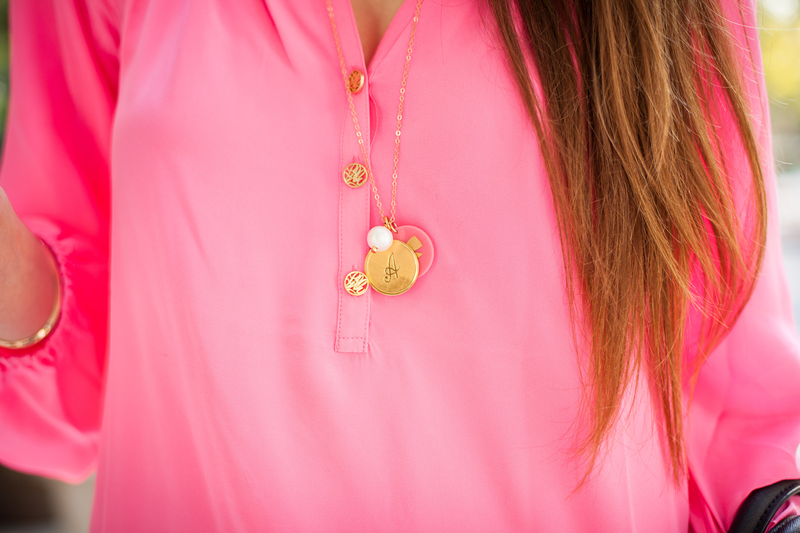 I finished off the look with this cute charm necklace from Moon and Lola- they were a sponsor of TBSCon that I attended this summer, and all of the bloggers that went got to make their own necklace at Moon and Lola's charm bar! Are you also a fan of preppy and classic looks for work? And how do you feel about some of this fall's biggest trends? Never apologize for having your own style, girl! You own the bright, preppy look much better than I ever could! I love those polka dot pants! i love preppy classic looks for work, but prefer an edgier hipper after work look. love this outfit btw! What a great work look! Love this pretty pink top! I love the preppy look and will try new trends from time to time but I never force myself to like something. Im obbessed with that pink shirt btw! Love your polka dot pants! I have similar ones in black and gray, but I'd love a printed pair! You know I never mind a post with PINK!! Loving this top on you girl! OMG YES!! 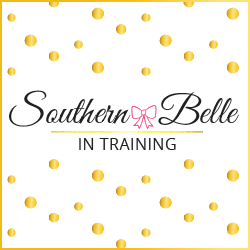 I pretty much love anything preppy and classic with a twist! Love the polka dots. Love the bright pop of pink! It's such an unexpected color for this time of year! 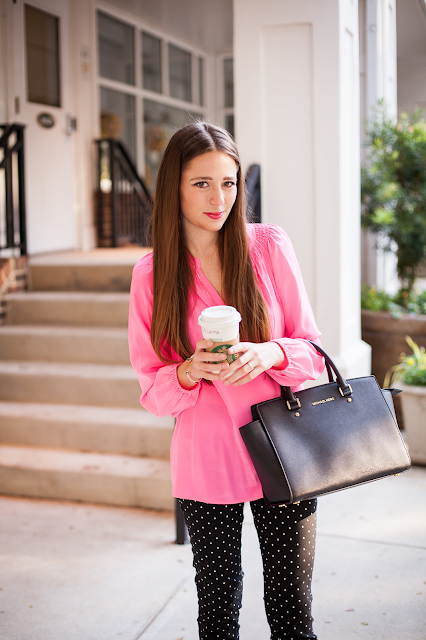 I lovelovelove everything about this look for work...from the pink to the polka dots! I am totally the same way! So many trends I just can't jump on this fall! I love your pixie pants and this pop of color! Definitely super fun! Those polka dot pants are absolutely adorable! Love then with the cute pink top!